As any Facebook user will tell you, receiving friend requests from complete strangers is not unusual. But one friend request from a “Tony Staplegun” caught my attention. In posts which must bee seen to be believed, the (presumably) anonymous user has taken aim at all of the confirmed candidates in the Rochester West by-election. “Tony” starts by looking at the independent candidate, former Tory and UKIP councillor Chris Irvine, who, before defecting to UKIP, had been selected as Kelly Tolhurst’s running mate in the ward. The next candidate to take flak from “Tony” is the Conservative candidate Alan Kew, whose business relationship with the other Rochester West councillor Stuart Tranter is a matter of public record. …but does have plenty to say about UKIP’s Rob McCulloch Martin. 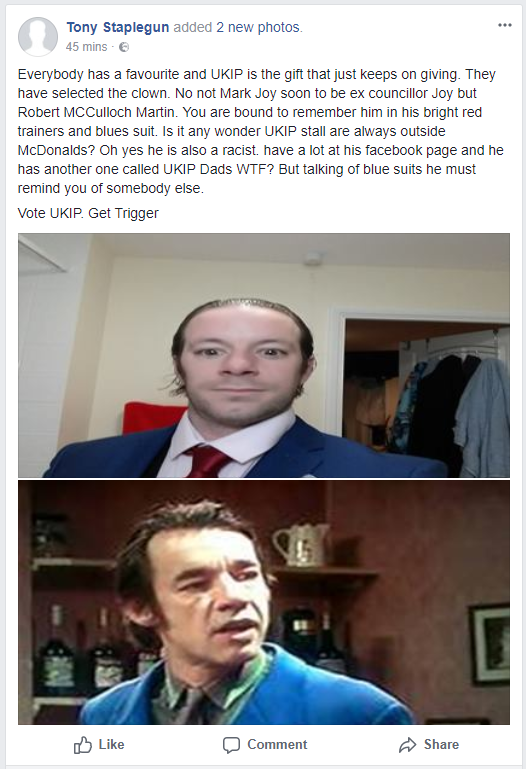 Incidentally, I wouldn’t advise visiting Rob’s “UKIP Dads” page if you are easily offended. …before returning to the criticisms, finally aiming his sight at Labour’s Alex Paterson. 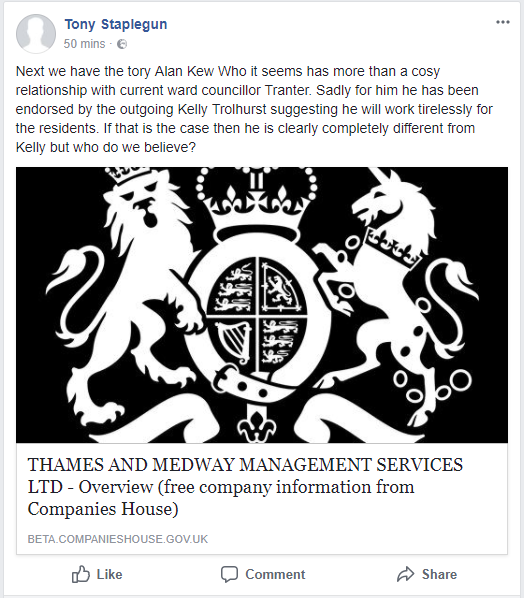 It is not clear who is behind the “Tony Staplegun” Facebook profile, which is published without a profile or cover photograph, but whoever it is appears not to be a fan of Medway’s political class. That said, it is surprisingly refreshing to see a little bit of humour injected into what seems to be an otherwise stale election campaign. Who exactly is Robert? Why does he not state his full Name? I, Chris Spalding will formally respond to these comments when the person making them decides not to hide in such a cowardly fashion.